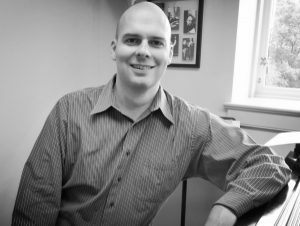 Jason Haney’s works have been performed at Carnegie Hall, the Kennedy Center, the Scotia Festival, Music2000 in Cincinnati, the Composers Inc. concert series in San Francisco, Richmond’s ChamberFest, the Staunton Music Festival, and elsewhere throughout the US, as well as in Canada, Europe, South America and Hong Kong, and by groups such as the New Millennium Ensemble, the Chester Quartet, the Sunrise Quartet, Colloquy, the Indiana University New Music Ensemble, the Berliner Kapella and the American Modern Ensemble. He has won awards and honors from ASCAP, the National Association of Composers USA, the Music Teachers’ National Association, the Washington International Competition, top honors in the University of Oregon’s international Waging Peace Through Singing competition, the Berliner Kapella Composition Prize and a Dean’s Prize from the Indiana University School of Music, where he studied composition with Claude Baker, Frederick Fox, Donald Freund and Eugene O’Brien and completed a doctor of music degree. He is currently on the faculty of the School of Music at James Madison University. Commissioned in 2015 by trumpeter Chris Carrillo, Gravity Well is an eight-minute work for trumpet, percussion and piano. The opening, which has the members of the ensemble rotating around the pitches of a slowly evolving harmony, reminded me of objects orbiting in space. Bowed vibraphone is also used at the beginning to supplement the resonance of the piano. Later in the piece, a faster section increases the momentum, the bongos, log drums and wood block come into play, and eventually all three players converge on a single pitch at the conclusion, like a singularity toward which the whole piece has been inexorably drawn.